Art, as I saw it one day when I helped hang a National Academy show while I was a student there, was about cows. In those days, early in the twenties, there were many cow paintings. More than that, the cows always stood knee-deep in purple shadows. For the life of me I never learned to see purple where there was no purpleand I detested cows. I was frankly distressed at the prospects for me as an artist. A bit impolite, as Katharine Kuh's last name means cow in German. 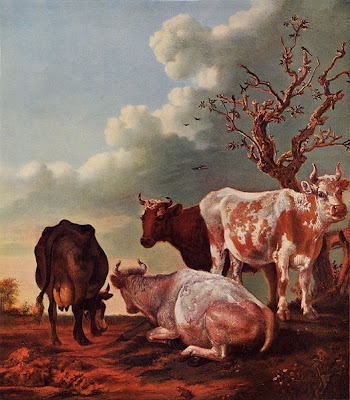 As for me, I'd much rather see a painting of cows than one of humans. It is well to find your employment and amusement in simple and homely things. These wear best and yield most. I think I would rather watch the motions of these cows in their pasture for a day, which I now see all headed one way and slowly advancing,watch them and project their course carefully on a chart, and report all their behavior faithfully,than wander to Europe or Asia and watch other motions there; for it is only ourselves that we report in either case, and perchance we shall report a more restless and worthless self in the latter case than in the first. Indeed, all the ways and doings of cattle are pleasant to look upon, whether grazing in the pasture, or browsing in the woods, or ruminating under the trees, or feeding in the stall, or reposing upon the knolls. There is virtue in the cow; she is full of goodness; a wholesome odor exhales from her; the whole landscape looks out of her soft eyes; the quality and the aroma of miles of meadow and pasture lands are in her presence and products. I had rather have the care of cattle than be the keeper of the great seal of the nation. Where the cow is, there is Arcadia; so far as her influence prevails, there is contentment, humility, and sweet, homely life.